The flow of liquids and gases plays a crucial role in numerous processes. Engineers and product developers are therefore constantly seeking optimal flows for certain applications. Computer-based flow simulation systems provide considerable support in these development activities. Currently, lattice-based simulation methods are predominantly used for this purpose. Here, the phases - fluid or gaseous materials - are represented as volume shares in lattice structures. When complex problems such as fuel injection are involved, the lattice has to be moved along with the interface between the liquid and the gas, which requires enormous processing power. In multiphase flows, this technology meets its limits. Scientists at the KIT Institute for Thermal Turbomachines (ITS) have opted for a new approach. 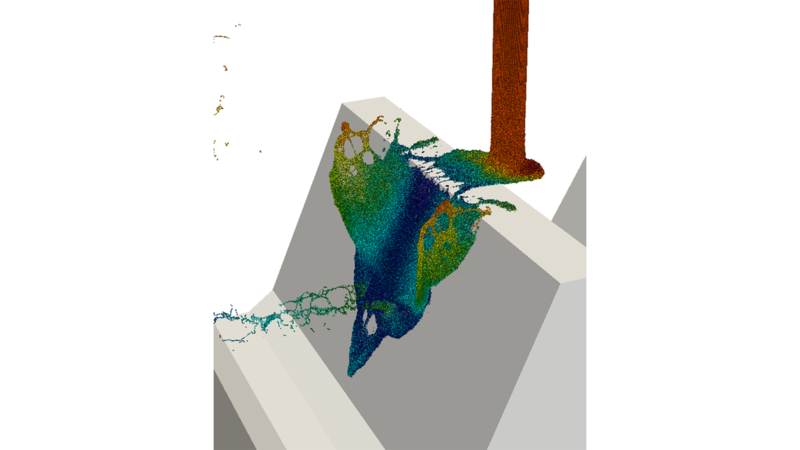 They have developed a simulation solution based on the Smoothed Particle Hydrodynamics method. Here, fluids and gases are split into mass packages called particles whose motion follows the laws of fluid mechanics. Movements of and interaction between individual particles enable flow fields to be realistically simulated. Being free from the lattices, complicated boundaries and interfaces subject to strong deformation can be represented without major effort. Based on this approach, a virtual test stand has been developed that comprises all the important steps in a flow simulation: from the pre-processing of the CAD data through the calculation of the flow to their visualisation in post-processing. In addition to conventional simulations, the simulation results can be viewed and manipulated from all possible perspectives with the aid of virtual reality.